Mike Yould is all fired up about providing Nova Scotians with Kansas-style cooking on a grill. 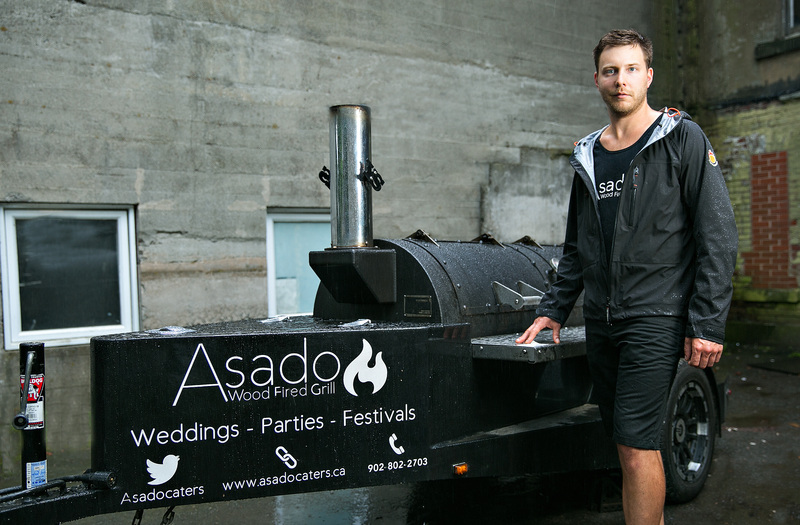 The Asado Wood Fired Grill catering service he started two years ago is smoking-hot on Nova Scotia’s weddings, parties and festivals circuit. Combine that with his management of the kitchen at Bearly’s House of Blues and Ribs in Halifax, and Yould has sparked a successful, year-long barbeque food catering business. Having had an initial small business loan and later a working capital loan through CBDC Blue Water, Yould is quick to recognize the role the organization has played in his company’s development. “They were a very good stepping stone to starting my business off. I couldn’t have done it without them,” he says. Yould approached the CBDC two years ago on the advice of his father and “mentor,” David Yould, an entrepreneur who himself connected with CBDC Blue Water and went on to become a director of the organization. The younger Yould had worked in the restaurant industry previously and been running an informal barbeque catering service with a partner, which showed a lot of potential. They had built a trailer and put a grill on it and towed it to farmers markets. Unlike a food truck, where the cooking takes place inside, Yould and his partner were cooking in the open. “People were really intrigued by everything being cooked in front of them. It was very interactive,” he says. His partner eventually moved on to another opportunity in western Canada, and Yould took over Asado. He did a couple of weddings and house parties, offering finer grilled foods, with appetisers, canapes, steak and seafood. For informal events, such as farmers markets, it was more southern-styled grilled chicken and ribs. “That’s when business really started to develop,” says Yould. The CBDC loans helped him set up with the right equipment, such as a Yoder Smokers barbeque manufactured in Kansas. He created a web page and branding and started targeting more weddings and other special events. He supplements the catering business with farmers markets, food truck, music and art festivals, which, in turn, help feed his marketing efforts. However, as successful as the operation was becoming, Yould was concerned it was largely seasonal. So last October he entered into a contract with Bierly’s House of Blues and Ribs, whereby he leases the kitchen and provides the meals for the restaurant. With Asado branding and menu, it gives the company more exposure and income during the winter months. Yould has since bought another barbeque and is training a manager to help him have two trailers on the go at various events this summer. Asado has gone from one full-time employee, and two part-time employees to three and three, in addition to Yould, And he expects to take on another two full-time employees during this summer. “So, I’m definitely providing jobs for people, which is nice”, he says. Yould’s plan is eventually to own his own restaurant in the Burnside area of Dartmouth to take advantage of the lunchtime and early dinner market there and have a permanent home for his catering operations. He’s waiting to find something in the right location at the right price. “I’m not trying to grow quickly. I’m just trying to grow in a strong way,” he explains. He has long since paid off the CBDC loans. And while they helped fuel his grilling business, Yould has no plans to look to the organization for any more money at this stage. “At this point, my business is growing on its own,” he says.